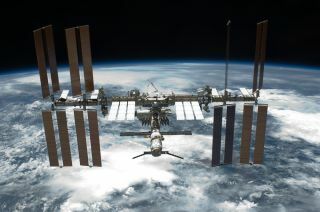 Students in the New York City public school system are competing to get an experiment on board the International Space Station, shown here. Inspired by the dream of seeing their work soar into space, 195 students in New York City are competing for the chance to put a science experiment aboard the International Space Station. The Intrepid Sea, Air and Space Museum in New York is hosting the new competition for middle school students in the public school system. Fifty groups of three to five students each will submit proposals for experiments that will test the effects of microgravity on a system. In May, one group will be selected to have their experiment shot into space and carried out by the crew of the International Space Station. At a kick-off event for the contest at the Intrepid museum, the competing students had the opportunity to participate in microgravity workshops, and ask Massimino questions about his time in space. "I was a New York kid," Massimino said in an interview. "And [the students] want to know, 'How did you achieve your dreams?' Because they see that I used to be where they are. There are a lot of kids [in New York] but there isn't necessarily a big presence of the space program, and now I'm working through the museum and this project to get kids involved and get them interested [in space]." The contest, officially titled the Intrepid International Space Station Challenge (I2S2C), is being conducted in partnership with the Student Spaceflight Experiments Program (SSEP) and The Ramon Foundation. The 195 participating students come from five New York City schools. Student Spaceflight Experiments Program was launched in 2010 to provide students with the opportunity to design and propose experiments to fly in low- Earth orbit, on the final flights of the space shuttle, and on the International Space Station. Recently, SSEP has worked in conjunction with private spaceflight company SpaceX to send student experiments to the station aboard the company's latest robotic Dragon capsule. The students who are competing in the Intrepid contest will have until the end of April to submit a proposal for an experiment "designed to assess the impact of microgravity on a physical, chemical, or biological system," according to a statement from the museum. The experiment must take place inside a 6-inch test tube, and not contain any materials that could pose a hazard to the astronauts. "The requirements are not insignificant," Tom Barry, manager of community engagement & family programs at the Intrepid Museum, said. "These schools are going to be dedicating a whole lot of time for this program. So the schools that are on board are the schools that we felt could fulfill all the requirements for the program." After the proposals are submitted in April, a panel of judges will select three finalists. The winner will be selected by members of the Student Spaceflight Experiments Program, and will need to be approved by NASA before it can go into orbit. "[The students] are going to go outside and see the International Space Station fly over New York City, and the winning team, they're going to be able to say, 'Hey! There goes my experiment right over head!'" Barry said. "It's going to be a really cool thing to win. And anyone who doesn't win, they're still going through the scientific process and they're learning how scientists operate. Competition is part of it." To learn more about the Student Spaceflight Experiments Program, visit: http://ssep.ncesse.org/.